Common Pleas Judge Mark A. Ciaverella of Luzerne Co., Pa., in one of the more shameful displays of judicial digression, got lucrative kickbacks from private juvenile detention centers after sending scores of children there, some who should have not been incarcerated. On Thursday, U.S. District Court Judge Edwin M. Kosik II in Scranton, Pa., sentenced Ciaverella to 28 years in prison in the “kids-for-cash” scandal and ordered him to pay about $1.2 million in restitution. He also ordered him off to prison immediately. Ciavarella and his co-defendant, Judge Michael Conahan, were charged in the scandal in 2009. They ended up entering a guilty plea, but Judge Kosik rejected it because the defendants did not appear to accept responsibility for their conduct. Ciavarella’s sentence on Thursday was about four times greater than what he would have gotten under his plea. As a result of the scandal, the Pennsylvania Supreme Court tossed roughly 5,000 convictions Ciavarella issued between 2003 and 2008, saying he violated the constitutional rights of the juveniles, including the right to legal counsel and the right to intelligently enter a plea. Authorities alleged that Ciavarella and fellow judge Michael Conahan took more than $2 million in bribes from the builder of the PA Child Care and Western PA Child Care detention centers. They also extorted hundreds of thousands of dollars from the facilities’ co-owner. Authorities said Ciavarella sent children to the private lockups, some as young as 10, and many of them first-time offenders convicted of petty theft and other minor crimes. In February, after an 11 day trial in Scranton, a federal jury found Ciavarella guilty on 12 of 39 counts: racketeering, racketeering conspiracy, money laundering conspiracy, conspiracy to defraud the United States, four counts of honest services mail fraud, and four counts of filing false income tax returns. 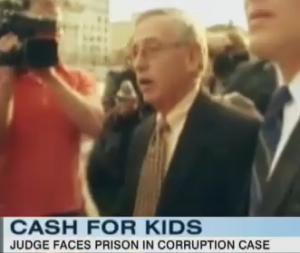 The jury also found that Ciavarella should forfeit $997,600, the sum he received from Robert Mericle, the developer who built the juvenile detention facilities. Ciavarella testified at trial, claiming that the payments he received from Mericle were “finders fees” or “honest money” with no connection to Ciavarella’s actions as a judge, and denied that he received payment from Robert Powell, owner of the facilities. The evidence established that Judge Conahan closed the Luzerne County Juvenile Detention Facility when he was chief judge and helped arrange the financing for the private facilities; that Ciavarella, as juvenile court judge, sent juveniles to those facilities; that both men obstructed efforts to question the county’s use of the facilities and their financial relationships with Mericle and Powell; and both judges used bank accounts, straw parties and real estate vacation property to hide and launder payments received from Mericle and Powell. Mericle and Powell have pleaded guilty pursuant to plea agreements and are awaiting sentencing. Conahan pleaded guilty to racketeering conspiracy in April 2010. He did not testify at trial and has not been sentenced. Ciavarella and Conahan resigned from the bench in 2009. Posted: 8/12/11 at 10:01 AM under News Story.